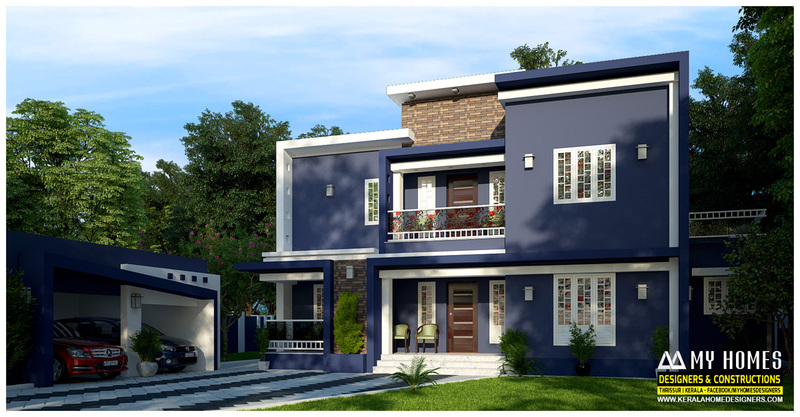 my homes designers introduce low budget modern style double storied villa.now a days construction cost of the house is quite increasing. so proper steps can be taken to refuse the construction and to make most beautiful homes.it is one of a novel design.it is contemporary style villa. most of the people worried about the cost of raw materials and other things need for the construction.it is a beautiful and well furnished villa. we are ready to render all service you need. the villa is well occupied. the interior and exterior of the house is very attractive.take proper care while construction of the house. the total build up area of the house is 2375 sq.ft. the ground floor of the house 1400. car porch and stout.total build up area of the car porch 360 sq.ft.the house offer full fledged facilities. the dining hall with a small prayer area. the stare case area. there is common toilet.two bedroom with bathroom. first floor of the house.two bedroom attached with bathroom.total build up area of the house is 975 sq.ft. in the first floor of the house upper living area study area.two bedroom attached with toilet and dressing area.